Her children’s classic, A Wrinkle in Time, was rejected 42 times before it was published. Her trust in God helped it see the light of day. A writer receives overwhelming affirmation from her readers. If you're sinking under the weight of all life's daily demands, here are some spiritual lifesavers. After sharing a pizza with TV producer Brian Bird of One Calls the Heart, an unexpected creative collaboration results. 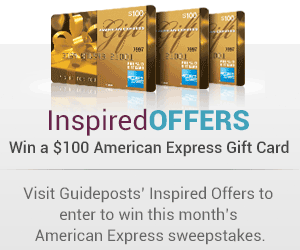 If you love reading Guideposts stories, you might love writing them. Here's how we can help. A positive sense of daily accomplishment is similar to a road race—compete against yourself only, and move forward simply by putting one foot in front of the other.